Remove the fish from the refrigerator and let stand for 15 minutes. Lightly salt each side of the fish with the kosher salt. Preheat the oven to 350 degrees. Heat the canola oil in a stainless skillet over high heat until it shimmers. Add the fish (presentation side down) and cook over high heat until the bottom is golden – approximately 4 minutes. Put the pan in the oven cook the fish through- which will take about two minutes. Remove the pan from the stove and flip the fish over to ‘kiss’ the other side for about 30 seconds. Serve with a drizzle of olive oil and a sprinkle of finishing salt. ENJOY! *This is black sea bass, a fish that is on the sustainable ‘ok to eat’ list- not to be confused with the Chilean Sea Bass, which is on the ‘About to Extinct’ list. See more here. This recipe is from Thomas Keller’s Ad Hoc at Home cookbook. 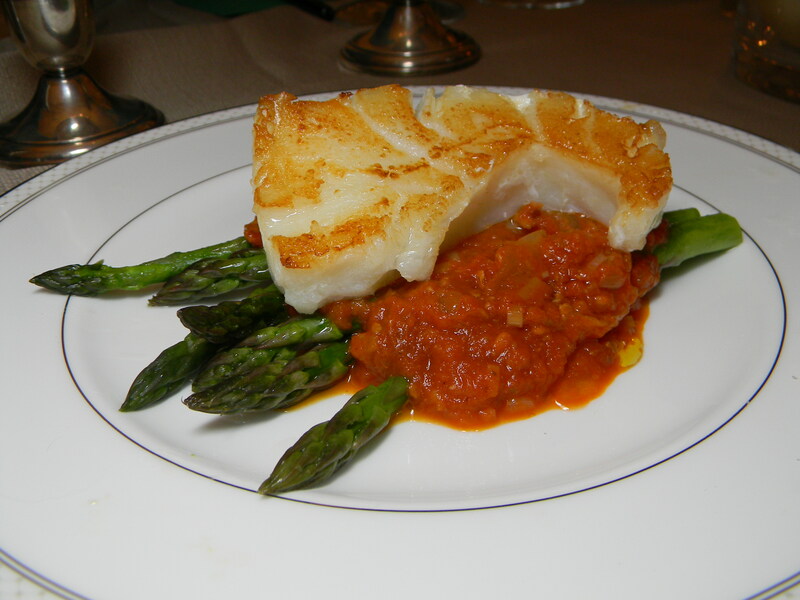 The original recipe is for pan-roasted halibut, but the sea bass worked well. NOTE: We served this with asparagus and tomato-bacon stew, also from Ad Hoc at Home, but there are many other sides that would go perfect with this buttery, rich fish.